Nate Quigley graduated from Brigham Young University with a BS in accounting and worked as a consultant for McKinsey & Company in their Los Angeles and Paris offices, before earning his MBA from the Harvard Business School. Vanessa Quigley earned her BA in Vocal Performance and Pedagogy from Brigham Young University and enjoys performing in opera and musical theater productions. Several years later, and seven children later, they are happily married and co-founders of Chatbooks, an easy photo book app. They started Chatbooks in 2014 as a small family affair. Today, more than 85 people work at Chatbooks, and they are aligned around the company mission: to help people hold on to what matters and live happy. Family photos and stories have always been important to us. Vanessa was an avid scrapbooker as a young mom and worked for one of the first “digital scrapbooking” companies. But, over the years life got busier with the kids she found it difficult to find time for scrapbooking. When our youngest child was just five, Vanessa found him in bed clinging to a photo book his preschool teacher made for him. He only had this little album to show because she had never made a photo book for him, much less had a printed a photo of him. This was Vanessa’s aha moment. She knew she needed to get her photos out of her phone and the cloud and into the hands of her family. Nate immediately got to work with a small development team and in a few weeks had a prototype of an app that automatically printed their Instagram photos into a series of photo books. In June 2017 we won the Ernst and Young regional Entrepreneur of the Year award— just three years after starting our business. That was an amazing moment as we celebrated the rapid progress our team made together. Secondly, we are very proud that our company has a family-friendly environment and work culture, specifically, being a great place for women to work. Chatbooks was just recognized on the Women Tech Council’s Shatter List (which features companies who implement impactful measures that help break the glass ceiling for women in tech) for our diversity and inclusion practices for women in technology. We are committed to raising the bar in this area. We moved our family from Florida to Utah because we believed it would be a great place to start a high-growth business and raise our seven kids. And we weren’t wrong! You can’t talk about Utah without mentioning the incredible lifestyle here. In Utah, we’ve found affordable housing and world-class skiing, hiking and biking in the most beautiful mountains. Enjoying family time in the great outdoors has been key to balancing the stress and demands of running a startup. With three major universities within an hour of our office, we enjoy incredible access to talent. We also enjoy access to capital and have raised $23 million right here in Utah. Additionally, being involved with Silicon Slopes has provided access to numerous networking and educational events in this booming entrepreneurial and tech community. The people you want to work with are often spread out over a 50-plus mile stretch of I-15 (and in Park City and Heber too) so choosing where to locate your business can be tricky. We started in the Provo area but eventually added a Salt Lake City office. If you can be flexible about how often your team is together in one place, you have a better chance of building your dream team. We’re glad to see lots of improvement coming on I-15, and continued investment in public transportation options. Traffic congestion is a problem we all want to solve. So far, four of our seven children have decided to go to BYU; and we aren’t sad about that. We love living close to our adult children. Family is the most important thing to us, and we are grateful to be building a company that helps strengthen families one photo book at a time. 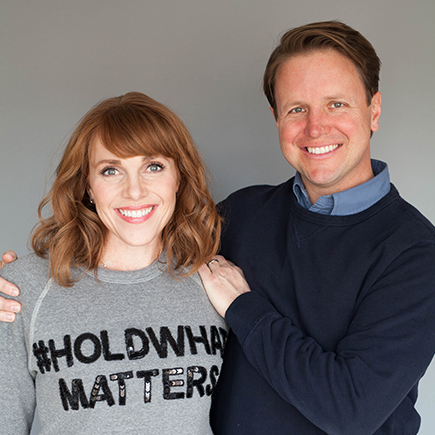 Nate and Vanessa Quigley, co-founders of Chatbooks, have a mission to help people hold on to what matters and live happy.